Baked curried tofu has been a weekly staple of mine lately. It’s a great item for weekly food prep and works as a convenient source of protein in my daily salads. It also tastes great, has a great texture and is really easy to make! If you’re new to cooking with tofu you’ll see a number of different varieties of tofu in the store. Depending on what you’re making, you may want to press your tofu first. You can read this post for more on pressing tofu. 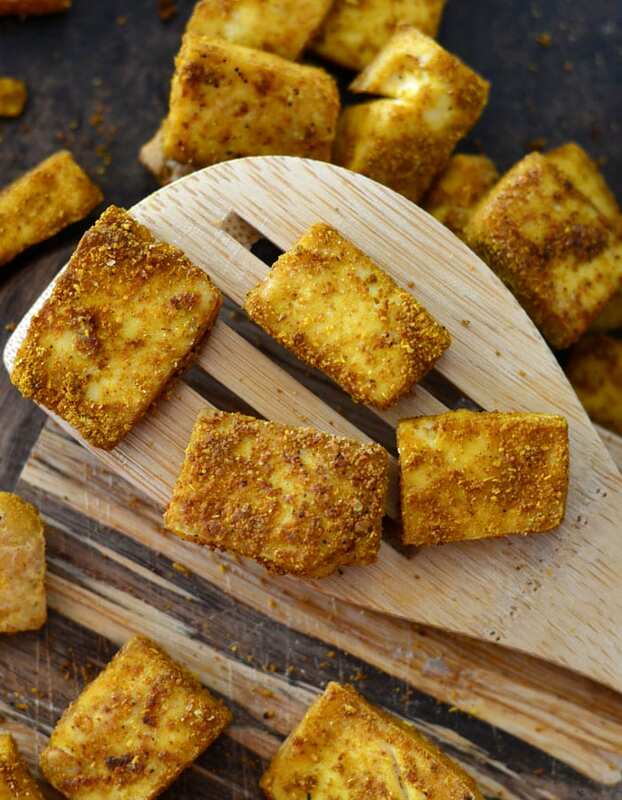 Pressing tofu removes excess water and allows the tofu to absorb more flavour as it cooks. 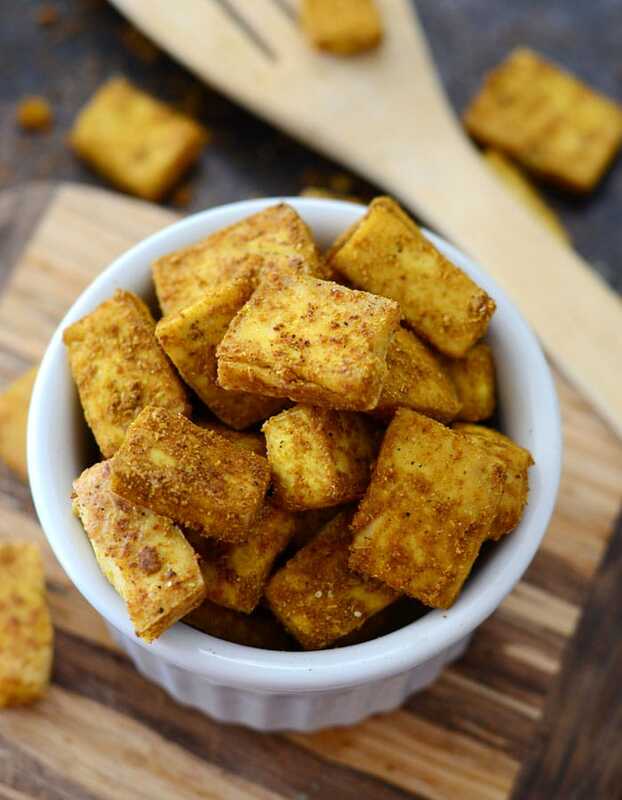 This baked curried tofu is barely a recipe…I’d say it’s more of a how-t0 for an easy, high-protein vegan snack. 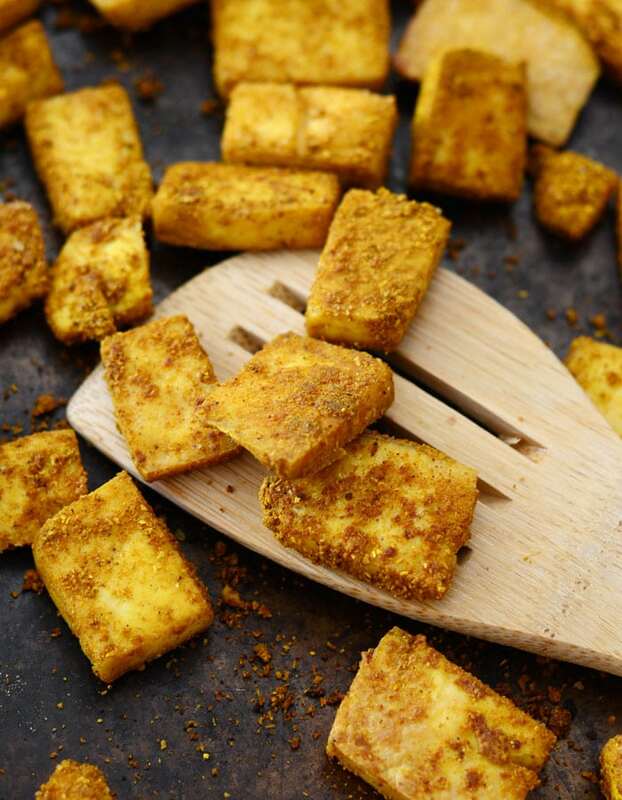 Simply cube tofu, mix with spices and bake until crispy. It’s so easy and so yummy! Feel free to try this method with your favourite spices, anything goes! …anything works really! What would you use?? 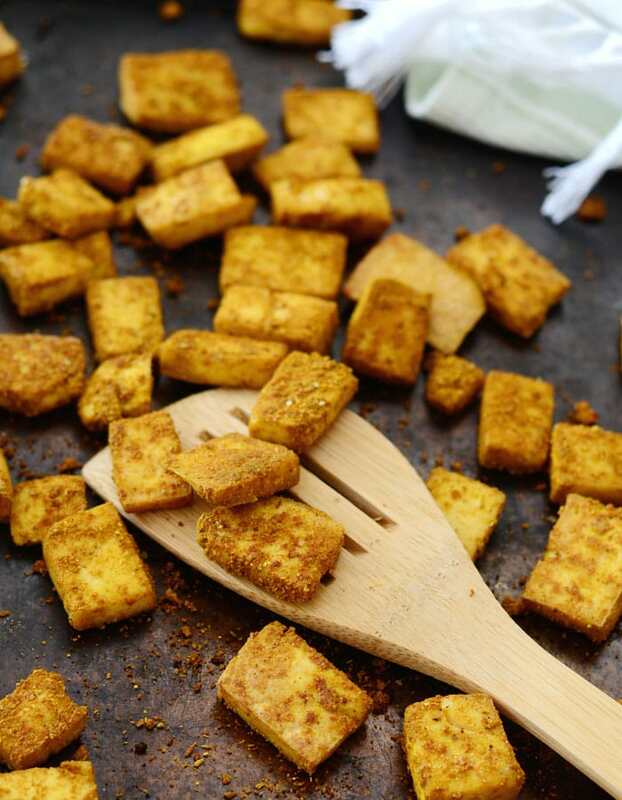 Cut the tofu into cubes, triangles or slabs. Add to a container with the spices and shake to thouroudly coat all the pecies. Bake at 400 degrees for about 20-30 minutes until crispy, flipping halfway through. I like your recipe and will definitely try it but…. What’s with all the ads! Seems like too many. Ads help pay the bills! Haha, yes they do. Food blogging is not cheap! Do u think this would work pan fried ina nonstick skillet? Its way too hot to put the oven on! YUM!!!! I love easy baked tofu recipes. That tofu looks so super-coated and awesome! 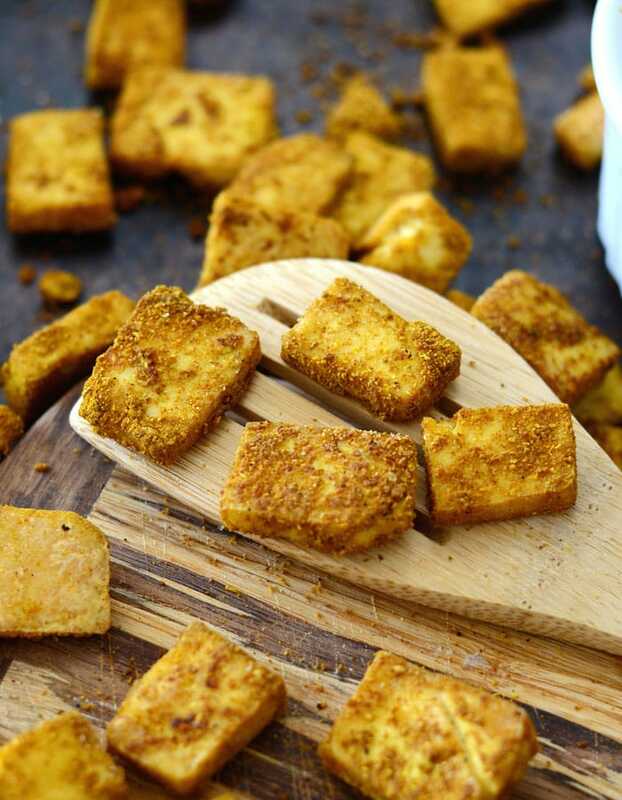 Its tasty !Gives different look to tofu.easy to make. Recipe says: “1 few tablespoons of curry powder”. Is that one tablespoon or a few tablespoons? I think it’s a few tablespoons! I can’t remember though, I’ll have to make it again. This is why I need to write my recipes down in a notebook. I would recommend starting with 1 tbsp and see if you want to add more or not. Are you draining/wrapping the tofu in a towel with a heavy something-on-top first or just right out of the package? Sometimes I press it, sometimes I don’t. It will be crispier if you press it first but I find it’s just fine if you don’t too! Up to you 🙂 And yes, I just press by wrapping it in a dish towel and setting some heavy books on top. This sounds like an excellent recipe and I cannot wait to try it with various spice combinations. Also just seems so perfect to have on hand for salads, snacking etc. Its good in theory and looks good. I like the texture it gives the tofu but it over all doesn’t do much for the tofu it just made it taste like it was coated in toasted over concentrated spice. Is any oil needed for this? Nope! Just follow the recipe and you’re good to go!